Thanks to B.A.F.F.L.E.D. Fave Tonisha Hood of B.M.M.O. Consulting, we are bringing you our first fashion fix of the fall. Below are 5 fab ways to wear your scarf as we transition into the new season. Obviously scarves are typically worn as neckwear, but you can wear them on your head, too. Use your scarf as a headband, ponytail holder, or even a strand in braids. Have fun with scarves from the head down! This style is classic and chic. It can dress up a casual style, and add just the right touch to any outfit. It can be great for silk scarves and fleece scarves, alike. For instructions, click here. Backwards Wrap is the perfect look for jazzing up a plain top or blouse. Wrap the center of your scarf around your neck with the ends behind you; bring the edges back to the front, and work this look like a real fashionista. This style is perfect for replacing a necklace, and keeping the autumn chill at bay. 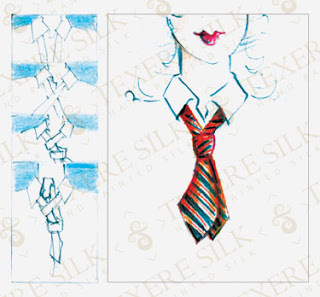 Sometimes ladies can have a tough time with this one, but here's a quick lesson on the guys' tie knot. We may not be wearing them with business suits like the smooth gentleman, but the men's tie knot can be a fancy look for the ladies, too. Here are the steps! A perfect wear for the look of someone on Chicago's Gold Coast, The Hamptons, or the Valley out west, this scarf style is great for fall. 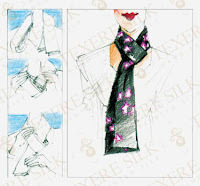 Simply fold your scarf into a triangle, drape over your shoulders, and tie in the center of your chest. Whether with a button-up top, or a cotton t-shirt, you're bound to turn heads. We hope these tips are helpful as the fall season kicks off. Shopping is always is a blast, but being able to recreate looks with pieces you already have puts you a step ahead! For many more ways, check out this site!